Promoting the uniqueness of Fiji through their products is at the heart of everything that the Grace Road Group has been doing in Fiji. Grace Park, the Group’s Manager Public Relations says their love for Fiji and her people has made the group work hard to promote the beautiful and set-apart products that is synonymous with our island nation. “Fiji is unique. I wonder if the people of this land truly realise and grasp just how special Fiji is. It is not only beautiful but it is a totally a dream place to be in. People come from all over the world to spend holidays here, “Ms Park said. She said the Grace Road Group has invested a lot in promoting good and healthy living in Fiji and especially enhancing the idea of growing and establishing Fijian made products. 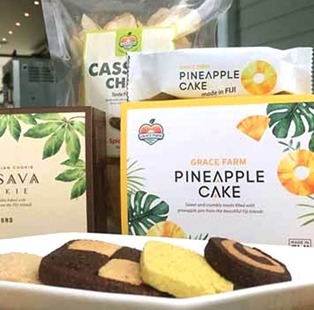 “We grow rice, we make our own specially made authentic products like cassava chips, kimchi (Korean delicacy made from locally grown cabbage), pineapple cake, pineapple cassava, ginger infused cassava cookies and the like,” she said. At the Korean Grill in Wailoaloa, Ms Park showed us the various products that were on display that are specifically produced by the Group. “Everything that is included in the making of these products is grown locally here in Fiji. “Nothing is artificial; nothing is brought in from overseas. Everything is grown here, everything is Fijian made,” she said. The Fijian made products from the Group is also in much demand from hotels. Ms Park said that they would continue to find new innovations to continue to promote Fiji.